The 24.32 metre sailing yacht Charisma Nova has changed central agencies and is now listed for sale with Manfred Haas at Haas International. Built in aluminium by Dutch yard Jongert to a design by Doug Petersen, Charisma Nova was delivered in 2006. Accommodation is for six guests in three cabins consisting of a master suite aft and two twins, all with entertainment centres and en-suite shower facilities. In addition, a double cabin accommodates two crew aboard this yacht for sale. A light-filled deck saloon offers panoramic views, a dining table seating six guests and an entertainment centre including a large flatscreen television. On deck, the luxurious cockpit with a huge Bimini top seats up to eight people and is the perfect location for cocktails and al fresco dining. On the technical side, she is equipped with a full set of Furuno electronics while her deck gear includes seven Lewmar winches, four being hydraulic while three are manually operated. 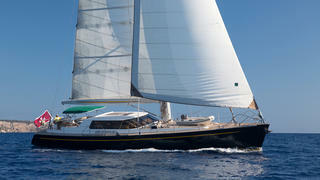 Her 32 metre mast is by Nirvana Spars as is her boom, and she comes with a hydraulic reefing system. A single Deutz 209hp diesel engines gives her a cruising speed of nine knots and a range of 2,300 nautical miles. Lying in Palma de Mallorca, Spain, Charisma Nova is asking €2,980,000 with VAT paid.